The Sisters of Mercy came to Melbourne in 1857 and have been at the forefront of healthcare and advocacy in Victoria for more than 150 years. We build on the rich charism of other religious orders with whom we share our commitment to mission, to inform the care we provide today. The Venerable Catherine McAuley founded the Sisters of Mercy in Dublin in 1831 to provide compassionate assistance to the poor. Her legacy continues today through the Sisters of Mercy and the many ministries of health, education, advocacy and community service they deliver — and through the hands of thousands of people who follow in Catherine’s footsteps working for organisations like Mercy Health. Mercy Health is a Ministry of the Institute of Sisters of Mercy Australia and Papua New Guinea. 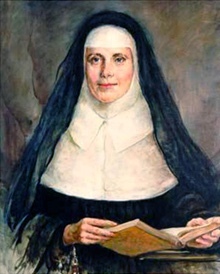 Catherine McAuley was born in Dublin, Ireland in 1778. Dedicating her life to caring for the poor, particularly women, Catherine established the House of Mercy in 1823: a facility built to house and educate poor women. In 1831 Catherine made her Profession of Vows and created the Order of the Sisters of Mercy. Sisters of Mercy should be particularly kind — the kindest people on earth, with the tenderest pity and compassion for the poor. The Sisters of Mercy went on to found convents, schools and hospitals across the globe. They arrived in Australia in 1846, led by Mother Ursula Frayne. The Australian congregation established schools and convents around the country and opened their first hospitals in Brisbane and Sydney. Following a devastating influenza pandemic, the Sisters of Mercy opened their first Victorian hospital — St Benedict’s in Malvern — in 1920. They established a reputation for excellence in care and hospitality that has grown in strength to this day. The success of St Benedict’s allowed the Sisters to open Mercy Private Hospital in East Melbourne in 1934, Mercy Maternity Hospital (later renamed Mercy Hospital for Women) in 1971, and Werribee Mercy Hospital in 1994.